Well, it took long enough, but I finally just caved in took digital pictures of the print pictures that were taken of me on the 400K back in May 2003. Crazy! I’d only been promising this since the site first came online! So, enjoy the shots, while I recount a few of the high-points of the ride. It was a year since the last 400K, a ride that I attempted and failed to finish, for a lot of reasons – lack of proper training, a failed 300K attempt only two weeks prior, a thrown chain only 5-miles into the ride, and finally falling asleep on the bike with only 40 miles to go, after a serious white-knuckle session on US-169 highway after dark, in construction. As I sat on the rear bumper of my car, waiting for the rest of the group to arrive for this year’s ride, I recalled each of these events in my head and wondered what the day-long event would throw at me this year. This year… a full year can do a lot if you learn from your experiences properly. 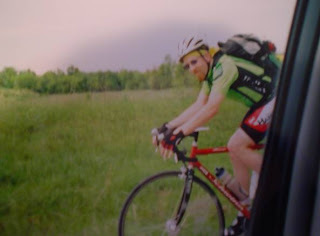 I had trained harder over the winter, had lost nearly 60 pounds, made improvements to the bike’s drive-train, enjoyed good showings at the 200 and 300K rides only a few weeks before, solidified my fueling program, and was encouraged that there would be no more white-knuckle session on the open highway since the re-opening of a bypass road. I was ready to rock. Losing weight over the early spring and coming back to form so quickly in the year compared to the year before was a huge boost to my mental game, and I was feeling downright invincible on this day in May – it was cool and foggy on that 3rd day of May – about 45ºF at 3:30am, when I made my way out to the lonely and dark parking lot of the start/finish, but it was forecast to warm up quickly, and there was not supposed to be very much wind. Any wind that was coming was going to blow out of the east, so my game plan was to get as far east as I could and then enjoy the rest of the day with a tail-wind. 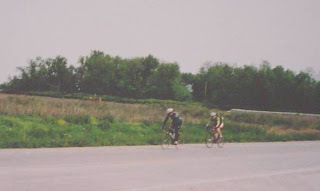 Unfortunately, the ride started in Grandview, MO, and most of the early part of the ride headed straight south before even turning east – it would be difficult to avoid some difficulty with the wind later. The route was also MUCH flatter than those beginning in Liberty, MO – there would still be the ubiquitous rolling terrain of eastern Kansas and western Missouri, but compared to the non-graded roads up north this ride would be a walk in the park. The only thing standing in the way was the distance itself. After all, 400 kilometers is no country spin. Roughly 240 miles is not something to take lightly, especially when you are up against the clock all day long. Regardless, I was feeling good – a quick pep talk from the ride organizer, and the ‘gun’ was sounded – the group of 30 or so riders rolled out of the darkness, headlights and taillights ablaze. Those first few minutes of any ride are probably the most exciting; pedals engaging, chains rolling onto gears, last minute good-luck mutterings, and dozens of sets of tires crunching sand and pavement. I bid farewell to my car, and promised silently to return this time, instead of being driven back like last year. The ride to the first checkpoint was intense to say the least. After making my way carefully to the front, I was thrilled to see one of ultra-cycling’s best in attendance; Dan Jordan. A Furnace Creek & RAAM competitor and all around ultra-distance guru; it’s a thrill to roll along-side such talent, especially as I am just beginning my ultra-distance career. There is much to be learned here, but in the early morning hours at the on-set of a 400K, there is not much time for talking. Getting east before the sun rises and the wind picks up is on everyone’s minds – the darkness is parted as our massive group blows through in a blur of headlights and heavy-breathing, and not much conversation. As we hammer thru the darkness, an early morning driver is caught taking liberties with a 4-way stop sign, nearly cutting a few riders’ ride short in a bad way. No-one expects to see cyclists at this hour, much less so many. We carry on, and hit the first major road on our way south – after a few minutes, we are in rural KC, out of the safety of the streetlights, and into the clutches of thick fog. The fog is serious enough that it might as well be raining: glasses are wet, toes chilled, tires slicked over – the dance of lights bursting from the fog confuses more that a few motorists, slowing down as we approach. Then, a train meets us at a crossing, breaking up a perfect momentum, but the rest is welcome – the pace for the first dozen miles or so was hot as everyone was trying to warm up. After the train passes and the gates lift, we’re off again, southbound on Mission Rd., to 199th, and then across into Spring Hill, KS. The twilight of dawn has snuck up on me – looking around, it’s becoming light already, and I’m already much farther along than I had been last year. Last year, on a fairly serious climb, I had wasted about 20 minutes trying to fix my fallen chain – a botched shift and mal-adjusted derailleur caused my rear wheel to lock up, and me to fall into a shallow ditch. As the pack whizzed past, I was alone with my mechanical problem, which I eventually fixed – but after that, I was riding solo for the remainder of the day, listening to a stiff link click, click, click all day long. So far, this year was going MUCH better – I motored along at 20 mph or above nearly the entire first leg, with nothing but smooth silence from the drivetrain and strength to spare in my legs. Before I knew it, I was coming into Paola, KS, and the first checkpoint. Dan Jordan was already there – even after my hardest effort ( a common rookie mistake early in ultra-events ) I was unable to hold his wheel. His cruising speed was much higher than mine, and shortly after a close-encounter with him near 199th and Antioch, he began to disappear up the road. There would be no catching him today, as usual! 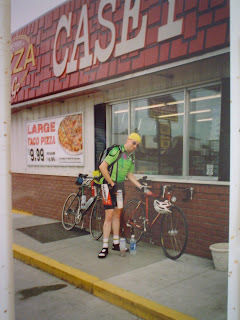 I did manage to hang with another randonneur, wearing a Bicycle Across Missouri jersey from a few years back – 575 miles in around 68 hours - a strong rider indeed. We exchanged pulls here and there for the rest of the day, and it was nice to have a companion for once, after having done so many of these in solitude. We pulled into Paola’s checkpoint at 7:20AM, after the 5:15am start (long pep-talk, missing the scheduled 5:00am start) – not bad: 41 miles in just over 2 hours, and the checkpoint had only officially been open for 22 minutes; but I was pushing too hard. I would be blown before the half-way point at this pace. After a ten minute stop, we were off again. Next stop was a Conoco station in Butler, MO – 58 miles away; the longest leg between stops on the route – just in time for our east wind to start blowing. We started at a slightly slower pace, but before long I was rearing to go again and began to lift into a solid rhythm, however the wind would take a little toll. We road just south of La Cygne reservoir, and into the straight and flat countryside of Missouri, then cut south to Butler and arrived at 11:05AM, despite really poor pavement on the ‘lettered’ highways – not a bad ride so far: 99 miles total in something like 5 hours and 30 minutes – not a record-breaking pace, but it was including an unscheduled detour for construction a bridge that was unrideable requiring us to walk our bikes across it, and our 10 minute break at Paola. I was having a blast, and making better time than I expected. The only drawback was a leg cramp somewhere near La Cygne, which was quickly remedied with an Endurolyte tab from E-Caps – life saver. We hit Butler, and checked in – a little refueling, and rest, and we were back in the saddle for the out and back jaunt to Appleton City, MO., the farthest east we would be riding – and the last leg into the wind, at least until the very end of the day near Grandview. We rode the quick 25 miles out to Appleton, checked in, and rode back, all in about another 4 hours total time, including the extended rest at Appleton City where I took the opportunity to change shorts, and refresh a little. It was a VERY welcome clothing swap, as my now-too-large shorts were beginning to start some saddle sores. The only disadvantage to losing weight: none of your cycling clothes fit right anymore. 154 miles, and about 10½ hours. little blurry; it’s a digital picture of a film picture that was taken from behind the glass of a moving car. Not too bad, actually! But, yes – still smiling despite the horrible pavement. big secret. Later on, I would tap-dance. It was a very good afternoon on the bike, as we continued north onto Hedge Lane and on towards Paola. We managed to reach the bridge that was under construction before the sun started going down, which was good since neither of us were looking forward to walking across it in the dark. Soon after that, we were rolling back into Paola’s Conoco, within 12 hours of having checked in there the first time! The sun was still up, and it was looking very promising that I would finish before midnight, which was my unofficial goal for the ride. At this point last year, it was dark and I was considering cashing it in – and not soon afterwards, I would. Then again, I didn’t reach Paola again last year until 10:00pm! This was going MUCH better. At this point, I was no longer concerned with holding a heavy pace – I had made the last checkpoint before the finish, and it was time to concentrate on just ‘finishing’. I let my day-long BAM companion head out, with a handshake and a smile, and said hello to my old friend Dale, who had been unable to attend the ride but still wanted to get some mileage in regardless. After a little rest, we decided to try and get a little farther north before the sun went down, preferably past the confusion of Spring Hill and the low-traffic of 199th St. We made good on that goal, hitting the pavement of 199th St, just before the sun finally dipped in the West. Taillights and headlights ON. Unfortunately, Dale’s headlight was not working for some reason – no problem; Dale would simply trail me for the ride back to my car in Grandview. Unfortunately, 199th St. is BLACK after dark. Even though I was putting a solid swatch of light on the road in front of me, Dale could not take advantage of it while in my slipstream – by the time we reached the Texaco station at 199th and US-69 Highway about 12 miles later, his arms were sore from gripping the bar so tightly. Twelve miles of riding into pitch black will do that! He decided to ditch there, and get a ride – but in order to finish officially, I had to continue. I big farewell to Dale, and continued onward into the abyss of nightfall in southern Johnson County. My last leg was one of the hardest of the ride – only a dozen or so miles to go, but there was a lot of climbing coming into the mix. The hilly and curvy darkness of Mission Rd, to 159th, to Kenneth Rd, which then becomes State Line Rd, and then east back into Grandview on Main St. – and by this time the wind was howling, and there was actually a flash of lightning in the distance from behind me. Thunderstorms had entered the forecast at some point in the day, but they were too far away to affect me now – 5 miles left, then 4, 3, 2, and 1. And the feelings flooding over me as I got my timecard signed for the last time that day are indescribable. I HAD FINISHED, and in the process had broken my personal highest-one-day-mileage barrier with 252 miles and change. Not only did I finish the ride before midnight, I was home and in bed before midnight, too! Awesome. And, as always – I can’t wait until next year! ride doesn’t count! Each checkpoint is designated, and your card must be signed and timed at each point. Then mailed back to you – this shows me completing the 400 kilometers in 18 hours, 4 minutes – stops and rests included. Not bad! 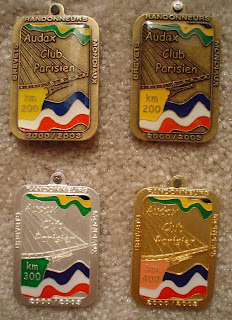 Plus, you get some handsome medals to hang on the wall! Let's get real here, Dude. "Team" G.T. finishes the Tejas 500!